We know very well that curryleaves added to any dish make them very much flavourful, this time i tried making this wholewheat bread along with mixed seeds,curryleaves and oatmeal..This bread turned super healthy,absolutely flavourful,totally addictive and definitely guilt free, serve this fabulous wholewheat bread with a bowl of soup and cheese spread, your dinner will turn out super filling and comforting..If you like spicy or savoury bakes even for morning breakfast like me,this bread also tastes fabulous with jam or nutella spread for breakfast with a cup of tea or coffee..
Stir in the active dry yeast,salt in luke warm water, keep aside until the yeast turns foamy, meanwhile take the flour,coarsely grounded oatmeal,chopped curryleaves,mixed seeds,chilly flakes in a bowl, add gradually the foamy yeast,water if needed,olive oil and turn as a soft dough..arrange this dough in a greased bowl and keep in warm place for two hours until the dough double their volume..
Preheat the oven to 350F and arrange a baking sheet over a baking tray..Punch down the doubled dough, knead for a while,knead well as a loaf..Arrange the shaped dough in a greased loaf pan, bake for 15minutes in middle rack, turn the oven temperature to 300F and bake for 20minutes until they crust turns brown..Keep aside and let them cool completely..
Wow, Priya U r a genius when it comes to creating new dishes . I have never ever thought of adding curry leaves to bread..:) Bookmarked it..
An aromatic, south indian flavored bread!!! Wow Priya, what a delectable & fragrant bread! I must try this! Only you could have thought about such an unusually delightful combination my dear! Kudos to u Priya, keep up the great work!! very interesting and perfectly baked !! Nice bake! Love the flavors. The texture and flavors are wonderful and looks tooooooo good. wow....Priya great...bread with curry leaves, very innovative n also u baked healthy version...Kudos to your creativity...Liked it !! Wow what a delicious bread. Bread looks good.Proofing yeast with salt is new to me. 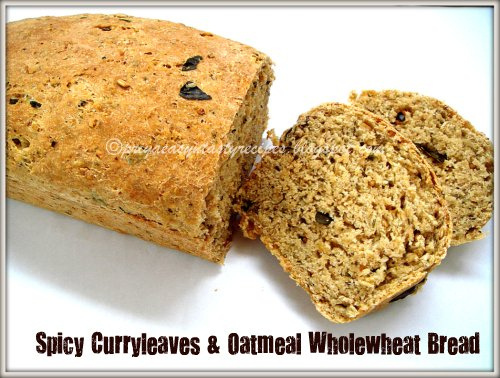 This healthy Curryleaves Oatmeal-Wholewheat home-made bread luks Spongy,yumm and Supergood dear.Luv to try it soon.Luv it. Wow priya curry leaves in bread...you are master chef.. Completely agree with the first comment. You are a genius with new recipes.. haven't baked a bread in so long, makes me want to try it. Brilliant idea of adding curry leaves to your bread.It would have tasted great.I never dreamed of such an idea even though I am addicted to curry leaves..Truly worth it dear. I can imagine how good the bread would have smelled with the curry leaves in it. Such a flavourful bread Priya..can just imagine the lovely flavours..you are a genius. this is awesome.. u r super brilliant..
delicious and healthy bread! I am sure the curry leaves are adding a yummilicious taste! Interesting one,looks flavourful n healthy bread!! Very innovative! Adding curry leaves in the bread is a great idea..
What a wholesome loaf! Love the addition of curryleaves. this is sooo yummy ! I love savoury breads ! bookmarked Priya ! Who would have thought about Curry leaves in Baked bread?? That sounds so awesome..it is a 'must bake' for me:) Thnx for sharing this unique recipe! I can smell the flavor here Priya, looks superb. What an incredible, delicious, healthy and super perfect bread. wonderful combination of flavors....must have tasted awesome! I like the addition of curry leaves.